Beautifully built and logically executed, a real open-ended controller delight. Beautifully built. Completely customisable. More than enough buttons. We always want more controls. You might have to do some setting up to make it work in the way you want. The Ohm64's build quality is impressive. Recently, for plenty of reasons, live performance of electronic music, has evolved beyond the humble DJ set, with more and more acts turning to their laptops and triggering external gear, internal tracks or controlling visuals, lights, patch changes, MIDI triggering and syncing with their performance pals. There's a world of options once you take your live show to the next level and everyone's preference is unique. There is one consistency throughout the new controllers that have landed, though, and that's their grid-based layout. It's no coincidence - each one of them is squarely aimed at the most popular performance software in town: Ableton Live. Much like Akai's APC40 Live controller, the Ohm64 features an 8x8 button grid as its main feature. We'll try not to compare too much to the APC40; although they are incredibly similar in approach, once you delve into the details, they are very different beasts. However, it must be said, there's only room for one or the other in your setup. The layout of the Ohm is very straightforward with four faders each side of the grid, with one pot per fader and an eight-knob matrix in the top left. The build quality, like its sibling the Ohm Controller, is absolutely fantastic. It feels incredibly solid, but isn't too heavy, and its varnished wooden exterior is slick and stylish. Each fader is perfectly smooth but solid and tight at the same time, with a hardened rubber coating, while the pots are of a similar style and stiffness - this thing feels like it's going to last a lifetime and already, its price tag begins to be justified. Round the back of the Ohm sits its connectors - namely USB and MIDI. The MIDI I/O is a welcome addition for controlling external gear but, for some reason, the ports don't have In and Out labels - an odd omission. Regardless, this is a really useful extra - using the Ohm Editor software (more on this later) and with a little help from your manual, you can go ahead and map a complete custom controller for any synth, hardware effects unit or even lighting rig (the Ohm will have to be connected to a computer for power, though). After the initial wow-factor of the exterior, it's time to get to work with mapping. Before we even open an application, there are a few things to bear in mind with the Ohm64. Livid Instruments has designed it to be completely adaptable - every element of the controller can be customised, from the CC/Note of each button right down to the LED feedback response. Livid is keen that you make the controller your own, and the included software editor is on hand to make life a lot easier. It acts as a kind of software middleman, and is where all your customising of the Ohm64 takes place. The Quick Assign box follows your mouse clicks and fader movements ready for you to edit. One thing that must be pointed out, though, is that you must press the Send button before any modifications are recognised by the Ohm64. Another important feature is the Save To Ohm button - this writes your settings to the flash memory of the Ohm, maintaining the settings when the Ohm is switched off. There are also backlight level controls and you will have the press the Flip XFader button, otherwise it's inverted in Ableton Live. Speaking of Live, as it's the most popular performance software around, it's no surprise that the Ohm's layout is particularly suited to it. Mapping is a tough thing to review as the whole premise is that it's completely customisable, so if you don't like that the buttons below each fader mute the channel, or that the knobs above pan, you can easily change it. What we're looking for is illogical physical layouts or deficient controller options. We're happy to report that, although there could always be more controls, we were more than satisfied with the options presented. We used the 8x7 of the grid as clip launch, with each bottom button being the stop for that channel. The eight faders acted as gain controls, with the eight-knob section mapped to the Dry/Wet of eight master channel effects and the numbered buttons below each fader as low-kill. We found ourselves feeling comfortable and having fun quite fast, despite the Ohm being unlabelled. The LED feedback helps too, and although it's not as impressive as the colour-coded APC40 clip matrix, it is a logical solution, and it can be modified. Suffice to say, the mapping options are sufficient and the spacing and layout are sound - we struggle to imagine where you would be disappointed. The Ohm64 comes at a great price when you consider the huge number of control options, the MIDI I/O and the beautiful build quality. Add to that the Ohm Editor and its comprehensive editing options and you're really investing in a complete solution. And of course, if you are that way inclined, its open-source nature means that a little Max/MSP creativity can really take the creative possibilities to another level. 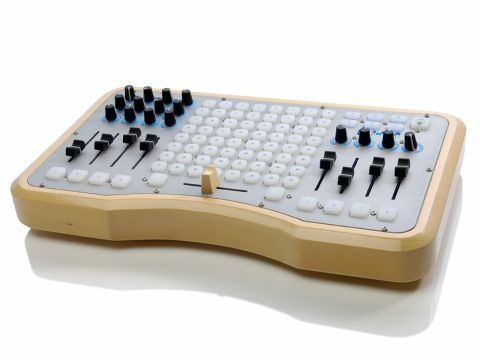 The Ohm64 falls somewhere between an APC40 and a monome, and that's not a bad place to land. It's up to you how you use the Ohm - whether as a custom modular part-sequencer, part-controller, part-instrument device or a simple 8x8 button map unit for Ableton Live, it performs elegantly.